For centuries, the monarchic Galactic Empire and the democratic Free Planets Alliance have struggled for control of the galaxy, but now this fight is carried on in the struggle between the ideals and ambitions of two men. Japan’s most legendary space-opera finally makes its arrival in English. For centuries after breaking free from the yolk of monarchic Galactic Empire, the democratic Free Planets Alliance has been locked in a battle for survival with the Empire. Engaged in a war of attrition, the two sides fight an unending battle borne out of inertia. The year is 796 Space Era (“SE”) or 487 Imperial Calendar (“IC”). Referred to as the “Golden Brat”, Count Reinhard von Lohengramm is a military prodigy of low birth who rose through the Empire’s ranks after the aging Emperor took his sister Annerose away to be his mistress 10 years before. Determined to rise to unconstrained power and dispose of the Empire from within, Reinhard leads his small fleet of twenty thousand vessels on an expedition to bring the Alliance forces to heel. Meeting him in battle are three Alliance fleets, where a young Commodore named Yang Wen-li serves aboard one of the flagships. Yang is a tactical genius who distinguished himself in a prior operation, but wants nothing more than to finally reach peace one day. As the two forces clash, the rise of these men promises to reshape their nations as well as the galaxy itself. Readers looking for a more grounded and politically based science fiction novel should definitely be checking this series out. At its core, Legend of the Galactic Heroes is the exceptionally well-realized political struggle of ideals of two men struggling to reshape their nations. 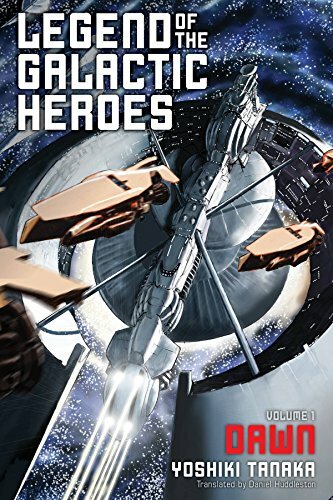 Conveyed in the form of an epic space-opera, the stories of both Reinhard and Yang demonstrate their struggles vividly as they fight against the establishments of their respective nations. There are no aliens to be found here, as Legend of the Galactic Heroes spends its time examining the clash of ideals and influence of politics in a more grounded story than is typical of many sci-fi sagas. 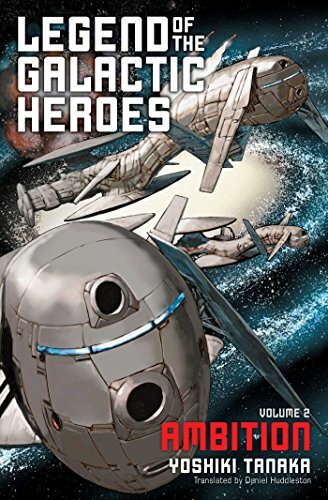 I enjoyed the care with which author Yoshiki Tanaka establishes his setting - the first chapter of the book briefly surmises the well-detailed and thoroughly interesting genesis of the Empire and the Alliance. This was especially helpful considering the constant references to their joint history as well as the thematic emphasis on learning from history present throughout the story, and I enjoyed the way that this introduction set the context for the political moves occurring later in the novel. Although Legend of the Galactic Heroes is concerned on a larger-scale with the clash between the Alliance and the Empire, this struggle is primarily played out in the stories of Reinhard and Yang. Both of their personalities are portrayed in a strong and captivating manner, with their characterization developed as they are tested by their actions in battle. This is most apparent in Yang’s story, as his ideals are explored through his struggles with the rigid and glory-seeking aims of many within the Alliance power-structure. This made for a compelling thread throughout the story as we see the way his ideals allow him to rise in the ranks much to his chagrin, and I felt genuinely engaged with his story line on the Alliance side. Similarly, Reinhard’s personal mission to reform the Empire is grounded in his family’s own history, and this personal dimension made his own journey interesting as it visibly impacts his tactical decisions and choice of soldiers. However, I enjoyed that neither Reinhard or Yang are written as perfect protagonists, as they each have visible flaws - Reinhard’s hubris, and Yang’s personal inflexibility - which impact them even as they achieve their goals. While many of Reinhard and Yang’s struggles take place outside of the battlefield, Legend of the Galactic Heroes delivers in a big way in providing exciting and space battles. These battles are well-written, effectively alternating in perspective between characters in the Empire as well as the Alliance respectively to give multiple views of a situation. In less sure hands this could have created a confusing mess, but the battles are exceptionally clear and easy to follow. This doesn’t come at the cost of making the battles feel cheap either, as there is a strong emphasis on explaining the significance of tactics in each battle that appropriately detailed without overwhelming the reader. The emphasis on consequence of varying ideals on the part of the various commanders is also used well to make each result in battle feel earned. The internal clash of ideals on each side is used well to differentiate Reinhard and Yang from their compatriots, making their respective victories feel like a genuine and logical triumph on the part of their characters rather than a case of the protagonist simply winning because. This brings the themes of the story together nicely, emphasizing the combination of tactics, idealism and maneuvering leading to victory, clearly showing how individual struggles of these commanders changes the galaxy on an epic scale as the battles play out. A particular point of emphasis is on the influence and effect a commander has, both over their troops as well as over their nation. The consequences of misplaced ideals are also starkly demonstrated as we see countless lives lost because of the actions of one person, putting both each side’s actions in clear context. Legend of the Galactic Heroes also features an expansive cast of secondary characters populating each of these nations. This gave the book an appropriately wide-spanning that really emphasized the scale of the conflict at hand. While the focus remains squarely on Reinhard and Yang throughout, I found the cast to be interesting even if they were characterized mostly in accordance to their impact on the protagonists. This gave the book a more focused feel, and I enjoyed seeing the way that Reinhard and Yang’s ideals impacted their own decisions. However, I thought that Tanaka did a great job giving each character just enough subtle characterization through their actions that they never felt forgettable. Helpfully, there was also a character-listing at the beginning of the book that lists the names and ranks of each of the consequential characters, and I found myself referring to it often to keep myself abreast of the ranks of each character within each hierarchy. The political structures of the Alliance and the Empire are well-detailed, providing excellent context for the role they play: first, in the struggles between these two nations, and second, in the struggles Reinhard and Yang experience navigating the respective establishments of their own nations. I enjoyed how clearly Tanaka was able to convey each side as a textured entity beyond a binary dynamic of good versus evil. We quickly see that although the Empire and Alliance come from two differing political systems, each has its share of vainglorious commanders and militant zealots driving them towards conflict. However, the artistocratic character of the Empire and the bureaucratic nature of the Alliance are also starkly portrayed in the scenes showing the political process we do get to see, putting the effect they have on Reinhard and Yang respectively in context. While the focus remains primarily on the macro-politics of each nation, but I appreciated that Tanaka spends a bit of time examining the effect the war has on the every-day person before bringing this to bear on the overarching conflict once again. This was also integrated well into the later battles between the nations, as we see the way that the structures of each nation inform their tactics. This provides an interesting context for the rise of Reinhard and Yang, making their stories each more impactful as the battles go on and emphasizing the expansive impact of their actions. In terms of the translation, Haikasoru did a great job putting together an excellent release. Daniel Huddleston’s translation never felt overbearing or gratuitous, and I noticed no issues with the sentence structure or his choice of description. I haven’t read the Japanese version, but the translation flowed well and if I didn’t know this book was originally written in another language I don’t think I’d have been able to tell. Legend of the Galactic Heroes Vol. 1: Dawn blew me away with its thrilling combination of grandiose and tactically compelling military battles grounded by the individual idealistic battles faced by each side. The conflicts are laid out clearly, and the scale is impressive - but the book never loses sight of the human element of the struggle as played out in the individual stories of Reinhard and Yang. The focus on these two men results in an excellently paced book which never lulls for too long, engaging me with its mix of political dealings and tactical conflict. This book is highly recommended, and I can’t wait to read the next volume. Legend of the Galactic Heroes Vol. 1: Dawn was translated by Daniel Huddleston and published by Viz Media’s Haikasoru imprint on March 8th, 2016. Authored by Yoshiki Tanaka, the series was first published in 1982 by Takuma Shoten, running for 10 volumes.The series has also received multiple anime adaptions, with the main series licensed by Sentai Filmworks for release in English. Volume 2 will be published in English on July 19th, 2016.